Do You Read As A Writer Or A Reader? Two disparate events this week – we put up Lee Stoops‘ annotation of Volt, Alan Heathcock‘s short story collection, on Annotation Nation. 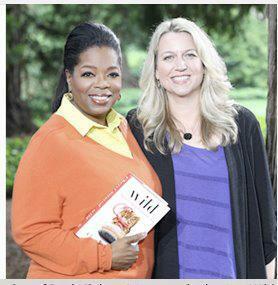 Then, Wild, the memoir by my friend and mentor Cheryl Strayed was chose by Oprah to relaunch her book club into Oprah 2.0. Wow. I feel remarkably luck to have had Cheryl as a mentor at Antioch. She had me flip the last two chapters of Growing Chocolate and *boom* the ending worked. Anyway, how are these two events connected? Lee examines Volt as a writer; Oprah has a section on her site with her favorite lines from Wild. Lee is a writer looking at the craft of another writer, things such as pace, tempo, language, and structure. It is the same process of learning in any craft – closely examining what another did and discerning how they did it. After character and circumstance, the element a short story requires to sustain its life and meaning is pace. Heathcock’s stories model methodic, measured tempo – the way a musician might craft the rise and falls of moving instrumentation. The effect is similar in that the reader can settle into the prose and let the story unfold at the speed at which it’s been set. Heathcock engineers the changes in pace with ultimate regard to the characters and their circumstances, without forgetting the reader and the needs he or she will have. Oprah is doing something similar. She picks out her favorite passages and explains why, but as a reader she’s looking primarily at the emotional effect the section had on her or what she learned from it. This is not less than an annotation, just different, a reading anno, if you will. She does it well and it clearly helps other readers in their process and that’s a great thing. First of all, I love the notion of a person as a flower with the petals disintegrating. I don’t ever recall having that feeling, but that image—so specific, so gorgeous—caused me to have great empathy for people who see themselves that way. I’ve mentioned before the importance of intentional reading. This is the difference between reading as a writer and reading as a reader. One is not better than the other, but if you are a serious writer, there is a difference in intentional reading for your craft versus reading for pleasure or other purposes. If you loved it, (and “it” can be anything from POV, character development, narrative, dialog, setting, sentence structure to use of metaphor and so on) how do you think the writer did that? How can you learn from his or her technique? If you hated it, what has reading this work taught you to avoid? How did the experience of reading the book inform your own writing? It’s an important skill and one worth developing. Also, Annotation Nation now has a page on Facebook. Come like us!